Every culture has a culinary specialty that raises the eyebrows—if not the gorges—of people from other cultures. Scots have haggis. Swedes have surströmming. Filipinos have balut, a hard-boiled duck egg. It sounds innocent enough, until you find out the egg is fertilized and allowed to develop from 16 to 20 days before it’s cooked. By this point, the embryo will have become distinctly ducklike, sometimes complete with body parts like eyes, beaks, and feathers. You are essentially eating a duck fetus in utero. 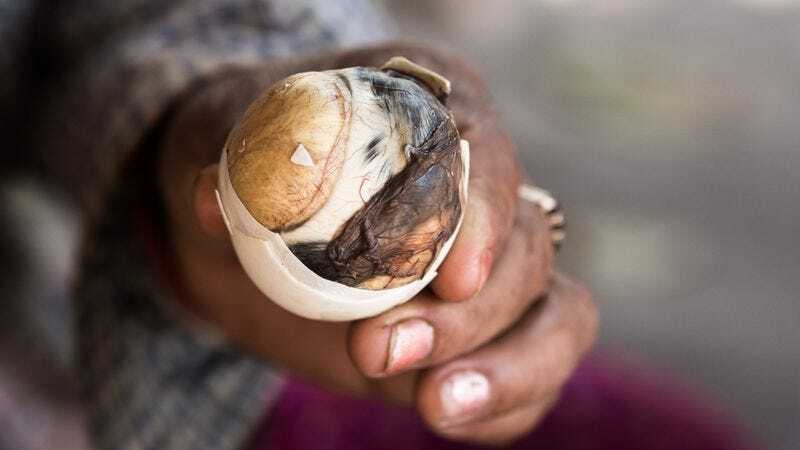 Other Southeast Asians like the Vietnamese or the Thais have their own versions of balut, and there is strong supporting evidence that the ancestor of the balut comes from China. But the Filipino version reigns supreme in international awareness, thanks (or not) to shows like Fear Factor that serve it up as a challenge to be choked down. It’s unfortunate that balut has been relegated to the “exotic adventure” category, because it’s genuinely delicious. Once you’ve cracked the egg and peeled a bit of the top off, you’ll encounter a clear broth so savory that there are people who only drink that and leave the rest of the egg. But if you’re game to move on, you can add a little salt or vinegar and drain the soup before proceeding. Some people peel and bite in increments to avoid actually seeing the embryo, while others just peel off most of the shell and eat the balut in one or two bites. Whatever your approach, you should always leave the albumen—the white part of the egg—behind, as it has the flavor and texture of a pencil eraser. Many people afraid to try balut don’t want to feel like they’re chewing on a duckling. But really, the thought of balut is more repulsive than the balut itself. In fact, the experience of eating balut is quite pleasant. A good balut yolk has a soft texture not unlike cream cheese. It’s not as sulfurous as regular hard-boiled chicken eggs. A good balut, including the embryo, is milder in flavor, and there’s nothing to be afraid of when it comes to the embryo’s texture. You’re not crunching through bones—it’s tender and dissolves in your mouth, almost like a mousse. Balut is traditionally seen as a post-sundown snack, with the joke being it’s easier to avoid looking at the embryo in the dark. But there are a few other possible reasons why balut consumption increases at night. It’s considered highly nutritious, a mini-meal that creates a lot of heat and energy in the body. Hence, not only is balut enjoyed as a filling snack during drinking sessions, it’s also developed a reputation as an aphrodisiac, with claims that it stiffens the knees (among other things). A typical red-light district is sure to include at least a few balut vendors alongside other services offered. At a jeepney terminal near the University Of The Philippines Diliman, the eponymous Ms. Lisa of Ms. Lisa’s Balut, a balut vendor who’s occupied the same spot for over 10 years, has a less titillating explanation for balut’s nighttime popularity. Ms. Lisa says most of her customers are either students getting ready to hunker down for a night of studying or laborers fortifying themselves for the long commute home through Manila’s congested roads. As we spoke, a dozen male customers dropped by her stall to eat a balut on the spot, seasoning them with salt or Ms. Lisa’s homemade vinegar-and-chili blend. (It’s honestly more terrifying than the balut, considering the proportion of chilies to vinegar in the bottle.) Ms. Lisa notes a high percentage of balut customers are men, though she says a few pregnant women consume balut, believing it’ll help them stay healthy throughout their pregnancy. Many street vendors buy balut from larger businesses in the municipality of Pateros, where balut has been produced for hundreds of years. Pateros, named after the duck industry (“pato” being the Spanish word for “duck”), used to be crowded with duck farms, but pollution has since destroyed many of the ducks’ natural food sources. Balut producers in Pateros now often source their raw eggs from other places like Bulacan province, home to many industrial farms. This has resulted in a heavier-tasting balut that has a meaty smell (which may explain the necessity of adding vinegar and chilies). Organic balut, such as ones sold at the upscale mall purveyor Green Babes, come from farms whose ducks still live on snails and aren’t given commercial feed. Compared to street balut, the eggs are distinctly larger, with more broth inside. The yolk is lighter in color and creamier, and the balut has a cleaner, more delicate taste, needing little more than a pinch of salt to bring out its flavor. Some of Green Babes’ customers have taken to enhancing their balut by incorporating it in stews and pastries, with caterers offering it as a special dish. Balut has long been seen as a working-class snack, but could it be on the path of gentrification like other street foods such as kwek-kwek (quail eggs) or isaw (pork intestines)? Maybe, though there is one big hurdle: balut’s exceedingly short shelf life. But if being hidden away in a pie is the consequence of gentrification, perhaps balut is better off without that mainstream acceptance. Modern life has distanced us from the bloodiness of food production, with our animal parts chopped and cleaned and delivered in neat, shrink-wrapped packages. To eat balut is to confront death, one that hasn’t been prettied up for our delicate sensibilities. The mental discomfort of eating balut is a bigger barrier to overcome than its actual, rather pleasurable physical sensation and taste. So it’s unfortunate that balut is frequently found on lists of bizarre foods; what’s truly bizarre is how difficult it is for us to deal with being reminded of what we’re actually eating.